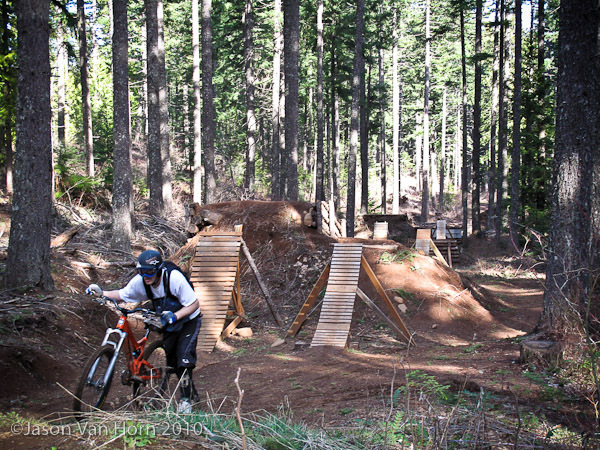 Hood River is known as one of the sweetest destination for Portland area trail shredders. 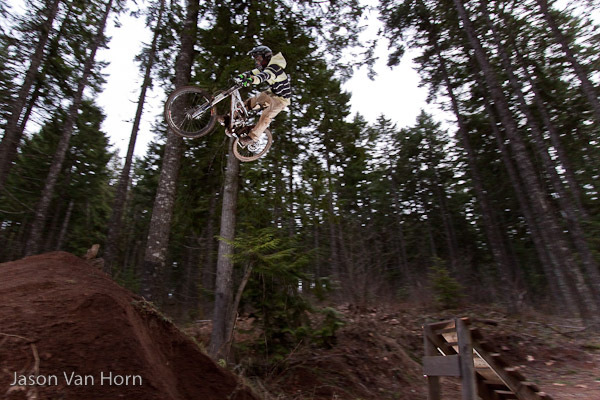 Whether you are looking to rack up shuttle runs, pedal some flowy single track, or develop your freeride skills, the Post Canyon area has something for you. Reaching the trail system means navigating a hour long stretch of the I-84 freeway, and yet many riders make it a regular trek. As one of limited shuttle friendly freeride destinations, Post is also a popular stopping point for many on the yearly Whistler pilgrimage. 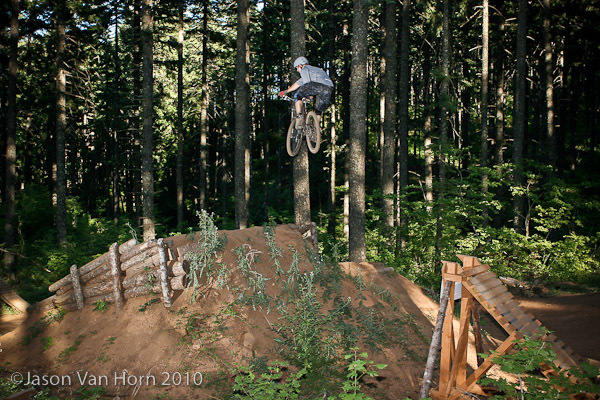 Having been a riding destination for a number of years, many of the features have become iconic in the NW freeride community, recorded for posterity on video clips populating YouTube: FMX, with its moto-sized wood launches; the wood jumps and ladder structures littering the miles of feature-filled black diamond runs; or the Barndoor/ Egg Drop, a rite of passage for intermediate freeriders. Cole Pruit sends it on the last jump of the FMX line. Post Canyon has some of the best freeriding around, but the trait offerings aren’t just suitable for freeriding, but great for all trail users. Some of our favorite days of riding at Post were the days we pedaled up the 7Streams single track to Family Man, then up 8 Track to Extended Play on our all mountain rigs, loaded with fun and additional challenge from riding the familiar freeride features on our light(er) weight trail bikes. 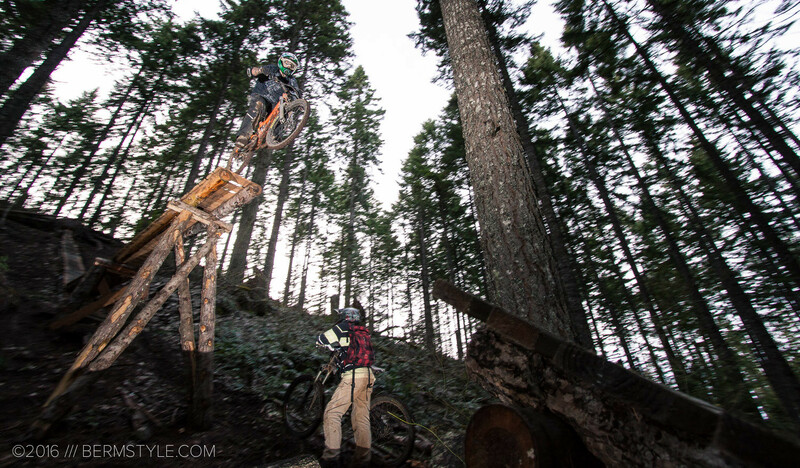 Post Canyon (along with the Black Rock Trails) sets the bar for freeriding in the Portland area, and local trail builders are regularly working to expand the riding options. Of all the lines at Post, the FMX line remains one of our favorite jump lines around. With large take-offs that extend over head height constructed from wood, the lines feature wide and forgiving landings. The line offers of two types of ramps: a transitioned take-off or narrower wedge-style ramps. A high amount of speed is required to clear the sizable gaps, and the run in has smaller dirt doubles to help riders gauge their speed- or filter out less experienced jumpers. The left line is by far our favorite; with a solid amount of hang time and a satisfying “vrooomph” as your tires run over the rungs at speed before you launch into satisfying weightlessness. If you haven’t felt it, it doesn’t get much better. On landing, you have a few seconds before you’re launched a second, and then a third time into the air. It feels super good the first time you negotiate the entire line, or your 50th. Although after 20+ runs through, it is amazing how comfortable you can get sending it. They are some of the easiest “big” jumps around, and could only be made better or more fun with the construction of additional jumps to the line. One of the other icons of Post Canyon is the Eggdrop, or as I like to call it, the Barndoor. Walking the wood ladder leading to the drop off is reminiscent of walking the plank, or preparing to jump off a high dive to the pool far below. 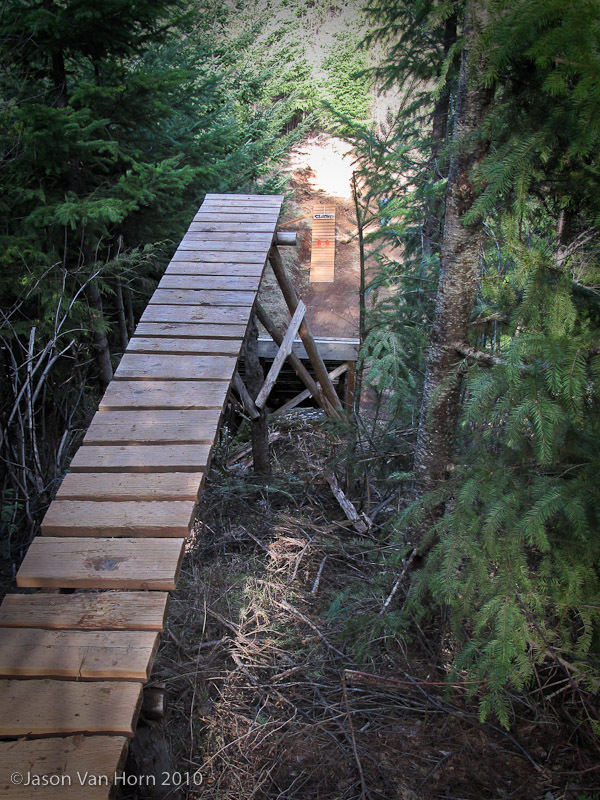 The landing area has a sizable sweet spot, making the drop technically one of the easiest features in the area. The irony is that the drop flows significantly better than the rutted out go-around line, and is actually easier to ride on the trail bike than going around. Either way, it’s a wicked rush, even more so in the context of an XC/AM ride. For riders not ready or skilled enough to negotiate the double black diamond lines, there is a great warm up and skills building area known as the Family Man. 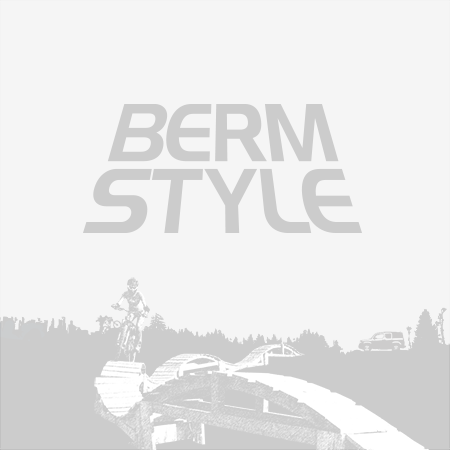 (see video below) With a beginner level jump line, an intermediate level drop line, as well as a pump track and ladder type features, it’s a popular meeting and session spot. There are plenty of great all mountain trails as well for those that want to pedal or get in shuttle runs. With a welcoming and relatively close knit riding community, especially compared to the restrictive riding rules and limited ride/build opportunities where we’re currently residing in the Bay Area, Post Canyon is a MTB mecca, and one of the many the reasons Post Canyon is one of my favorite riding destinations in the west. 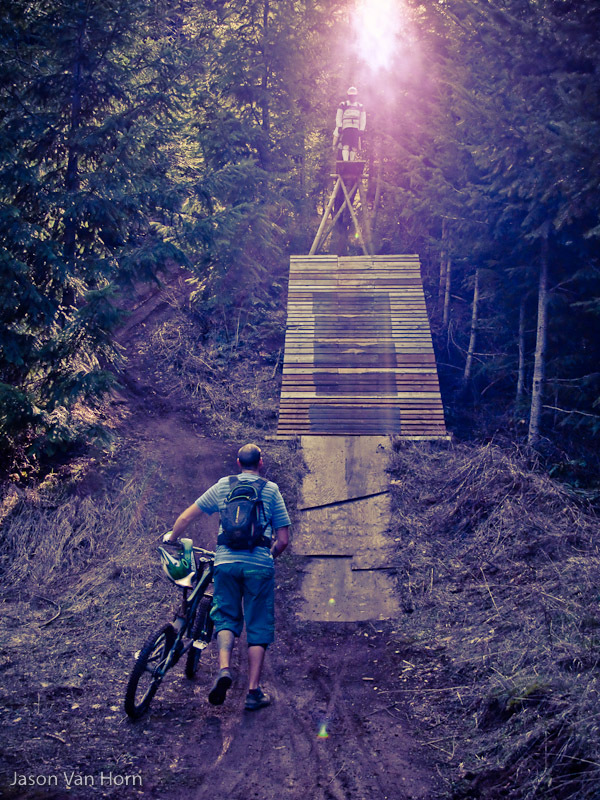 Our crappy edit- but you should get the idea of how rad this place is, if you haven’t ridden there yet. Riders: JVH, the Green Ninja, Nolan, Todd, Alex, and a few others.